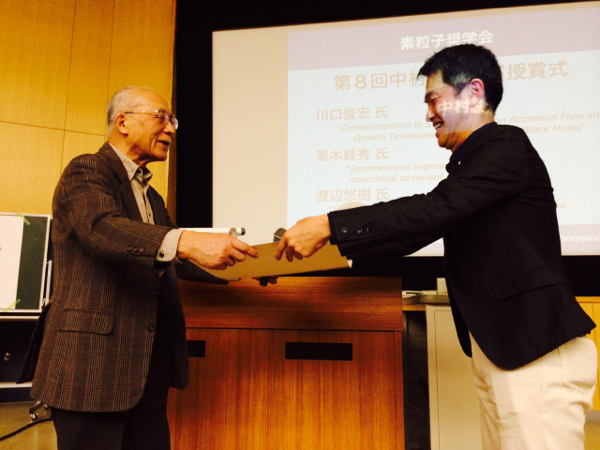 On March 27, 8th Seitaro Nakamura prize ceremony and the award lecture were held at the 69th annual meeting of the Japan Physical Society (Shonan campus, Tokai University). Tsunehide Kuroki, an Assistant Professor at Center for Theoretical Studies, who was awarded the prize for his research on the equivalence of the matrix model and the superstring theory, and its application to study of spontaneous breaking of supersymmetry in the theory, attended the ceremony, and was given a certificate from Michiji Konuma, the chairperson of the Soryushi Shogakukai. After the ceremony, he gave an award lecture entitled "Spontaneous supersymmetry breaking in noncriticalcovariant superstring theory."